Do you need another sign? Let's re-consider this; Ronald Reagan hand-picked for his Vice President, George H.W. 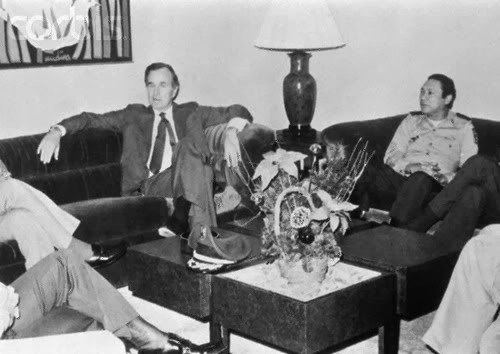 Bush, a man who had once been the head of the CIA – and moreover, Ronald Reagan also hand-picked William Casey as head of the CIA, a man who is suspected of personally arranging the arms-for-hostages deal with Iran... If Ronald Reagan new that William Casey was despicable enough to make secret deal with the enemy, and still be willing to name him head of the CIA; then Ronald Reagan wasn't concerned about the skeletons in Bush's closet either. Allow me to remind you what George H.W. Bush “once headed the CIA” actually means. It means he probably worked there before he got the job as boss. There are documents that show George H.W. Bush was working within the CIA as far back as 1963, (and was in Dallas along with Nixon when President Kennedy was assassinated.) So, if George H.W. Bush actually was career CIA (which of course the CIA won't tell us), it also means is that everything George H.W. Bush was associated with should also be associated with the CIA – including his time as member of the U.S. House of Representatives, his time as Ambassador to the United Nations, his time as head of the Republican National Committee, his time as Vice President to Ronald Reagan. His time as President of the United States. And even his son W's time as Governor and President and his son Jeb's time as Governor of Florida. When you think Bush, think CIA. Most Americans still believe that the United States invaded Panama to bring Manuel Noriega to justice. The mass media called him a dictator, a drug dealer, and a terrorist. But apparently that was just the cover story, and Manuel Noriega actually only played a minor role compared to the re-taking of the Panama Canal in the invasion of Panama. Manuel Noriega wasn't always an enemy of the U.S.. Manuel Noriega didn't just suddenly become an evil dictator. He had been who he was for years – and the CIA not only put up with it, they paid him – they may have even helped him become dictator so that he could help the U.S. crush the “communist” Sandinistas in Nicaragua. However, Manuel Noriega may have started to talk a little too uppity – much like his predecessor, Omar Torrijos. And then along came Manuel Noriega, with the U.S.'s blessings, of course. Was he involved with drug trafficking? Probably, but that didn't initially matter to the CIA. (And interestingly, a U.S. GAO study reported that drug trafficking actually doubled after Manuel Noriega was gone.) Was he a dictator. Yes, but that never seemed to bother the CIA anywhere else. Was he a terrorist? Only if one considers terrorism his support of the sabotage of the Sandinista government in Nicaragua – at the insistence of the United States. In what was another attack on a tiny little country of poor people, two to four thousand Panamanians died in “Operation Just Cause.” Likely most of them were civilians. Apparently, “collateral damage” is acceptable if America has a “just cause.” (George Orwell himself couldn't have come up with more Orwellian terms.) And apparently, the primary purpose of the invasion of Panama wasn't to capture Manuel Noriega. It was to destroy the Panamanian army. Because when Panama no longer had a military to protect the Panama Canal, the U.S. had an excuse to stay in Panama – to protect the Panama Canal. Since the invasion of Panama in 1989, the Torrijos-Carter Treaty was honored (by President Clinton), and the U.S. bases in Panama were closed in 1999. However, since then, construction of five new U.S. bases has begun. There have been more than 700 contracts signed for projects in Panama by the U.S. Department of Defense since 2000. A significant part of the reason George H.W. Bush lost the 1992 Presidential election to Bill Clinton was that too many Americans just didn't trust George H.W. Bush. Of course, there was that “read my lips, no new taxes” thing. And then there was that pardon of 6 Iran/Contra plotters. Moreover, many of us had our doubts about the Gulf War. Was it really necessary? Though the mass media tended to ignore it, the Gulf War had the feel of being set up – contrived – coordinated – even choreographed. Just a few months before Operation Desert Storm, the Soviet Union had collapsed. The Cold War was over. Americans wanted their peace dividend. And the military/industrial complex was worried. All those taxpayer dollars just might stop flowing. 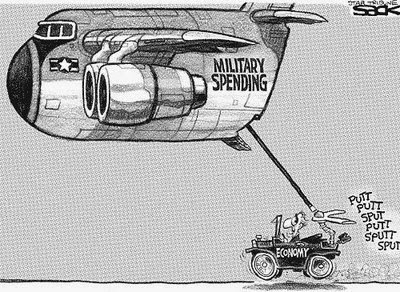 Without the Soviet Union to scare us, Americans were insisting that our tax dollars be spent on us. This was the biggest financial threat to the militarily/industrial complex since Presidents Kennedy and Nixon made the decision to withdrawal of U.S. Forces from Vietnam. ...and guess what? Within days, Iraqi troops were amassing on the Kuwaiti border. Note: Iraq had been in a long drawn out war with Iran from 1980 to 1988. Both countries had neglected their oil fields during the war. This meant there was a lot of untapped oil there. By America telling Saddam Hussein “we have no opinion” on Kuwait, and then going to war with Iraq over it; the Gulf War had the feeling of being contrived. It may have been we just needed to get rid of a dictator before he became too strong. But it may have been the oil. And then again, it may have just been all about our tax money. Remember that campaign promise George H.W. Bush made about “no new taxes?” Well, he raised taxes to keep from cutting defense spending. The first Gulf War was the last time America was actually in a real war. It was amazing to watch how powerful American military might was then. Iraq's army and air force didn't stand a chance. And no country has stood up militarily to the U.S. since.